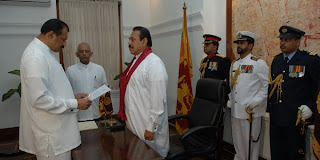 Retired Inspector General of Police Victor Perera was sworn in as the new Governor of the Northern Province, by Sri Lanka President by Mahinda Rajapakse, at a brief swearing in ceremony at the Temple Trees this morning. Lalith Weeratuna, Secretary to the Sri Lanka President was also associated in the ceremony. This is the first time, a former head of the police department has been appointed as a Governor to a province.Victor Perera who was the 30th Inspector General Police joined the police service in 1974 as an Assistant Superintendent of Police and was promoted as IGP on 12 October 1976. He retired from service on 30 June 2008. Subsequently on 01 July, Mahinda Rajapakse appointed Victor Perera as the first Governor of the Northern Province. He succeeds Rear Admiral Mohan Wijewickrema, Governor of the Eastern Province, who was also acting as the Governor of Northern province since 1 st January 2007, after North and Eastern provinces were demerged by a bench of five judges, headed by the Chief Justice, Sarath N. Silva, who ruled that the temporary merger of the Northern Province with the eastern province “unconstitutional, illegal and invalid". The ruling was delivered on 16 October 2006. Since then Northern Province became a separate provincial entity. The UPFA and the JVP are announced names of their Chief Ministerial Candidates but the United National Party is still not announced its Chief Ministerial Candidates and a party spokesman Gayantha Karunathilaka said names of their Chief Ministerial candidates are still kept secret due to the government pressure on their candidates. However UNP General Secretary General Secretary, Tissa Attanayake m revealed that a team leader too has been appointed to each district: Gen. Janaka Perera, Anuradhapura; H.M. Donald, Polonnaruwa; A.A. Wijetunga, Ratnapura and Jayatilleke Podinilame, Kegalle. But he too has failed to disclose UNP’s chief minister candidates for the two provincial councils. The UNP, SLMC and Western Province People’s Front have formed a common front to fight the elections under the Elephant symbol, Attanayake said. Howeverl major political parties and independent groups are now engaged in final discussions on nominations for the Sabaragamuwa and North Central provincial council elections. UPFA Chief Minister candidate for the North-central province is former Chief Minister Berty Premalal Dissanayake, while the Chief Minister candidate for Sabaragamuwa is former Chief Minister Mahipala Herath. Several political groups including the democratic group of the UNP are contesting under the UPFA. General Secretary of the JVP Tylvin Silva said the party’s nomination list has been compiled. Former JVP parliamentarian Wasantha Samarasinghe is the JVP Chief Minister candidate for the North-central province and the JVP Chief Minister candidate for Sabaragamuwa is Chameera Koswatta. At least 14 terrorists were killed and 12 injured in fighting ensued between troops and LTTE at the Wanni and Northern battle theatres on Wednesday (July 2), according to finalized military reports received. At the Northern battlefront in Nagarkovil, 2 terrorists were believed either killed or wounded when troops attacked an LTTE bunker defence using rocket propelled grenade fire and small arms fire at around 7.45p.m. Meanwhile, security forces deployed at the Vavuniya front continued advances into non-liberated territory yesterday as troops claimed killing 7 terrorists while injuring 5 others during the confrontations. According to security sources confrontation between troops and LTTE were reported from Vedamakilam, Uluvaneri general areas. Also, during a search operation conducted in general area Panichchamadu, troops recovered 20 anti-personnel mines (AP) and 5 hand grenades, security sources said. Separately, in general area Palaimoddai troops have removed 88 AP mines, and uncovered a haul of slam arms ammunitions during a search operation conducted.